Magical. That is the feeling on days like today when you witness migration on a mass scale. I knew it was going to be a good morning based on weather predictions of NW winds and it was. Deb, Jay and Brendan picked a terrific weekend to visit. We started at the canal and watched literally hundreds and thousands of birds fly past us for about 30 minutes. Mostly Kinglets and Yellow-rumped Warblers with a good scattering of Flickers mixed in. It was breath-taking. It is too much to try to photograph. We just kind of stand there and watch. After a while, we headed to the fields to see individual birds. We saw alot of sparrows, kinglets and Yellow-rumps. 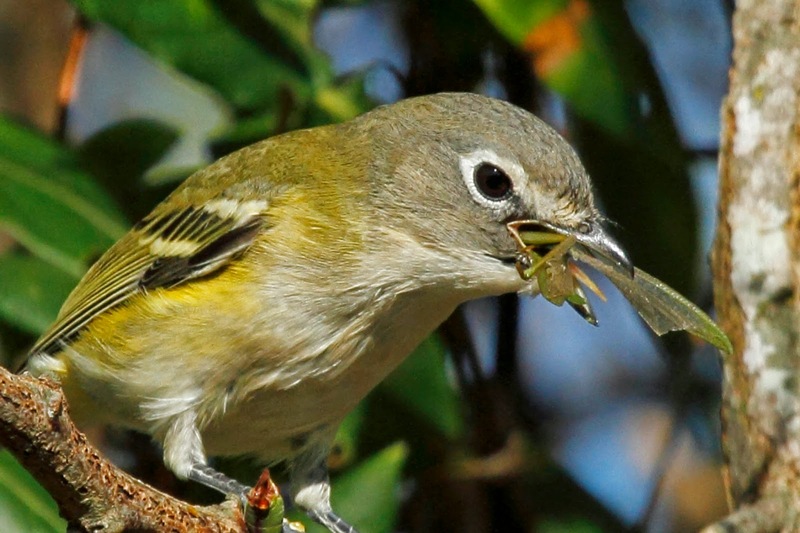 And then, a birding friend, Larry, pointed out a Blue-headed Vireo - one of my favorites. 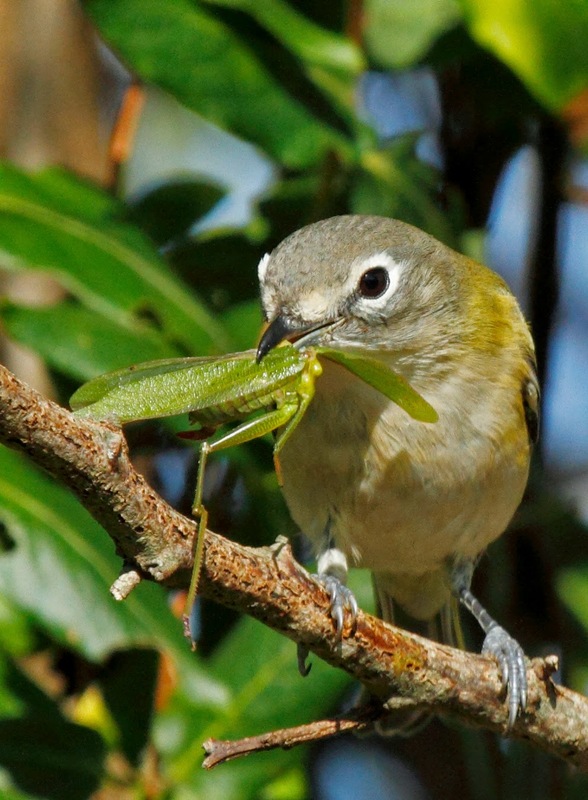 This bird put on a show devouring a praying mantis. It had the head decapitated and eaten by the time I could start shooting. It tried to gulp down big pieces of the bug. You can see it had a hard time. Birds have something called a nictating membrane on their eyes - kind of like a translucent eyelid which they use to protect their eyes. You can see it here. 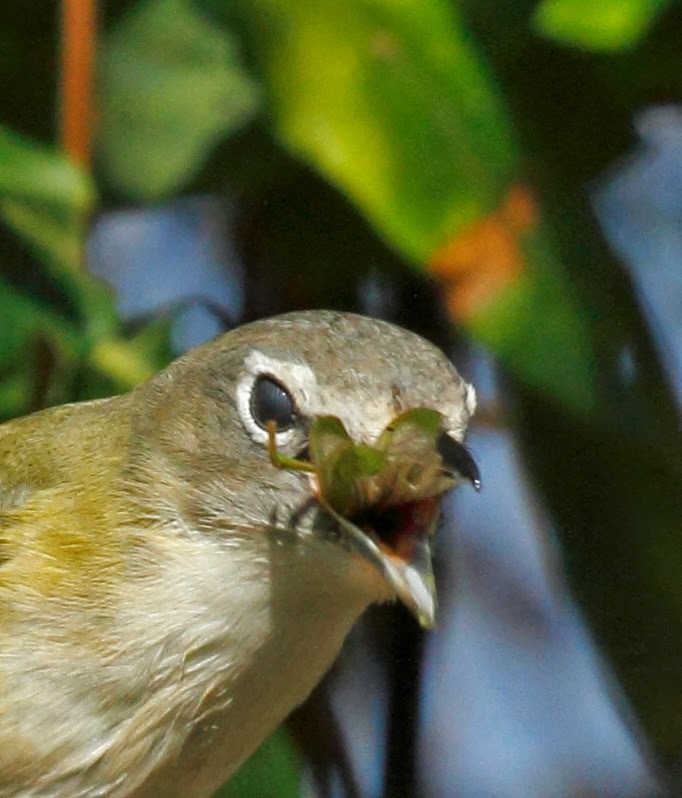 The bird uses the membrane to protect the eye from any stray body parts that might scratch it while they gulp down bugs. It makes total sense since the bird would not be able to survive if anything went wrong with it's eye. There is a whole group of finches that they call the "winter finches" which include Pine Siskins, Purple Finches, Crossbills, and some Grosbeaks. This is going to be a good year for Purple Finches - so says the "Finch Forecast" which is based on seed production of pine trees in Canada. Some guy looks at the cones of each species of pine/spruce tree and then predicts that some finches will travel south due to not having enough seeds for them to remain in Canada for the winter. It is proving to be true. We saw a dozen Purple Finches today alone. We usually see one or even none in a given winter. 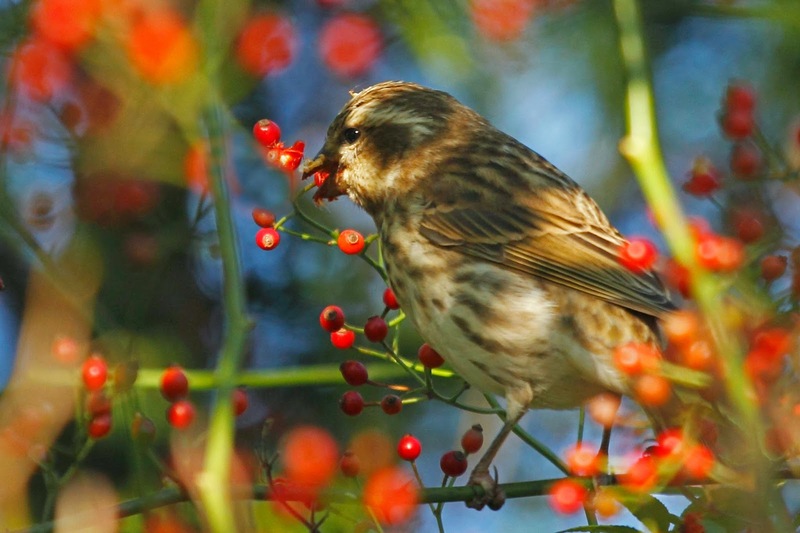 Here is one chowing down on some berries at Higbee beach. This is a young male or female that isn't purple yet. We had a terrific morning, then headed out to breakfast at our regular joint - Villas Diner - and then headed back to the field. The day definitely quieted down. 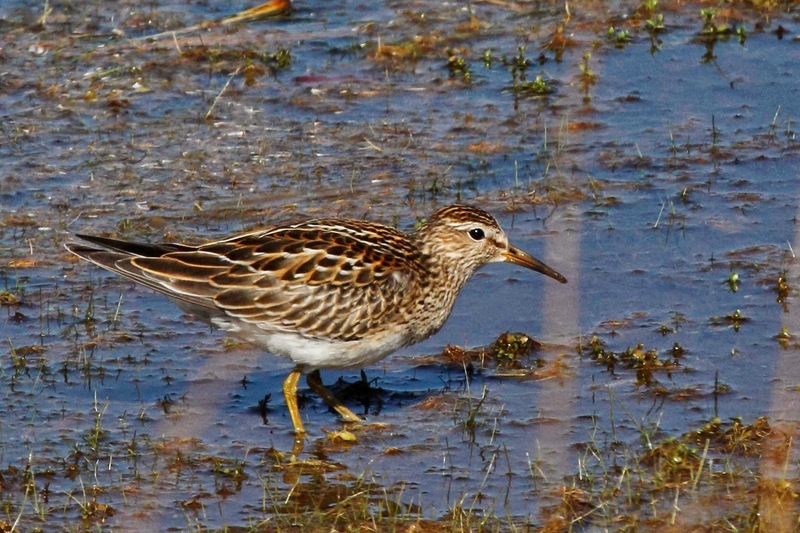 We stumbled upon 2 Pectoral Sandpipers at the State Park. The first of the season for me. I struggled with the ID on this one and had to ask Harvey for help. He is the shorebird expert. More to come. The weekend is only half done. Wow! Terrific photos (as usual)! Can't wait for tomorrow. 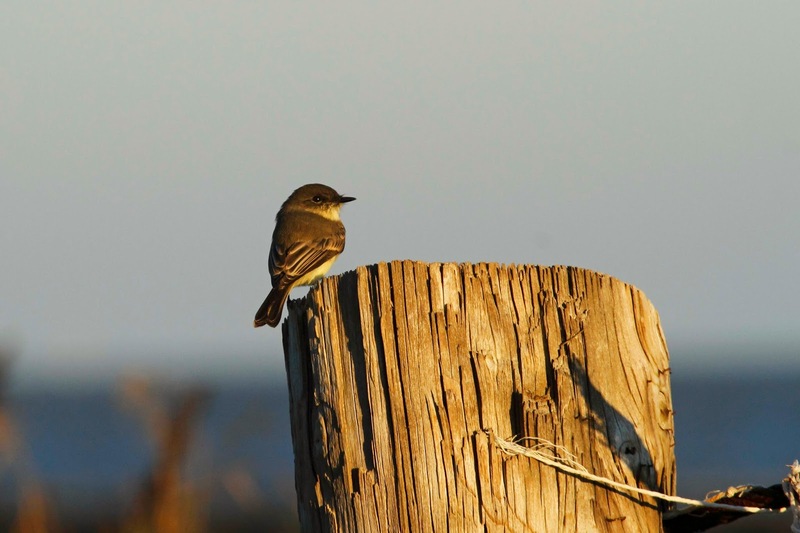 I'm especially jealous of the Vireo! We had one in our yard Saturday but I didn't get a picture.